Step stool provides a convenient 8" step to let you safely access items that are just out of reach. The durable construction securely supports up to 300 lb. Arched foot guides and the super-grip step tread help you avoid accidental falls. Nonslip floor protectors prevent the stool from sliding and keep your floor in its original condition. Foldable design can be easily stored in small spaces until it is needed. 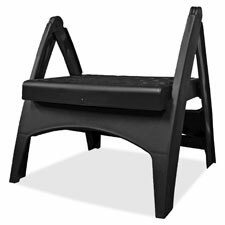 Step stool is perfect for keeping in a kitchen, garage, camper, dorm room and more. 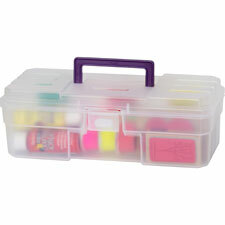 Multipurpose storage case is adjustable and includes removable dividers that allow from 12 to 62 compartments. Main section holds larger items. Separate lid section holds smaller items. Unique design won't let items gravitate to other compartments when lids are shut. Snap locks compartments securely. See-through case lets you locate items fast. Blue base section, clear lid section, black latches. 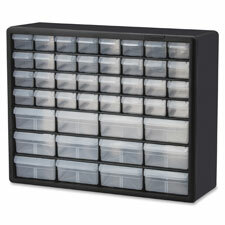 Stackable cabinet includes 26 combo dividable drawers to multiply storage options. Clear drawers offer an easy view of contents. Frame is made of one-piece, high-impact polystyrene. Stackable cabinet includes a pedestal base that fits securely into the recessed tray top. Frame is made of one-piece, high-impact polystyrene. 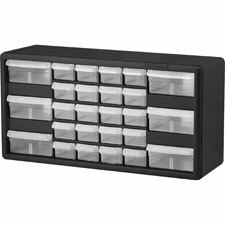 44 polypropylene dividable drawers allow easy view of the contents. Stop replacing worn-out, flimsy corrugated bins. 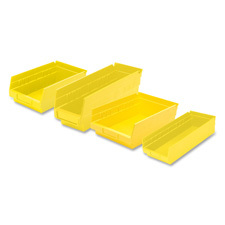 Shelf Bin outlasts corrugated bins and is designed to fit standard 12", 18", and 24" deep shelving or Akro-Mils Bench Pick Rack. 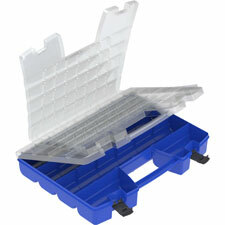 Ideal for economical storage or display uses. Superior construction allows them to be fully loaded without bulging or cracking. Durable polypropylene bins also provide an attractive, neat appearance. Rugged polypropylene makes the bins seamless, waterproof, grease-resistant and oil-resistant. Rear hanglock allows bins to tilt out for complete access. Bin also features a wide label holder.